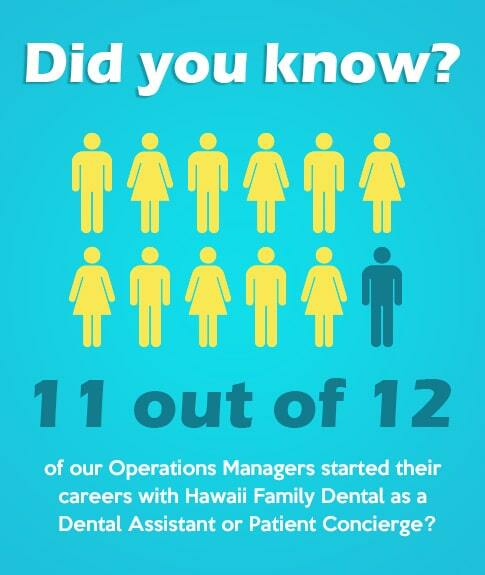 "What I appreciate most about working at Hawaii Family Dental is the support I receive and my friendship with the Center Manager who had an integral part in my development during the early parts of my career." Hawaii Family Dental. We Are True To Our Name. Hawaii. Living here, on tiny specks of volcanic earth surrounded by thousands of miles of open ocean, shapes everything. We are closer to one another. Geographically. Emotionally. More responsible for each other. Aunties, Uncles, and Tutus abound. We host baby luaus. Pile our kids—they’re all our kids—high with lei when they graduate. Family. In Hawaiian, Ohana. We’re more closely connected. There are no hard lines. Lineage blurs. What runs through us goes as deep as birth or blood. It’s a choice, an acceptance, a joyful obligation. The need to embrace. To give. To love. Native Hawaiian’s gave us the word for this, too. Aloha. Dental care is the manner in which we express it. We feel more connected to each other, inside our offices and outside. Staff members to colleagues. Our professionals to our patients. That’s why our family of experts, of dentists and hygenists, orthodontists and endodontists, receptionists and HR assistants, accounting supervisors and operations managers, goes to work every day with a singular focus. To provide the kind of compassionate care that will make our patients' lives a little better.